*Roy Ayers is among a select group of African American vibraphonists consisting of Bobby Hutcherson, Milton Jackson, Stefon Harris and Steve Nelson. Now that Lionel Hampton has passed, Roy continues to represent the vibe tradition. Best known for the song “Everybody Loves the Sunshine,” Ayers will help Carl Clay of Black Spectrum Theatre, celebrate 40 years via their 40th Anniversary Concert which includes comedian Gil-T. The concert will be held within Black Spectrum Theatre, located at 119-07 Merrick Blvd. (in Roy Wilkins Park at 177th Street near the Baisley Blvd. Entrance) in Jamaica, Queens, NY on Saturday, January 16, at 8:00 p.m.
“I grew up with fellow vibe player, Bobby Hutcherson, in Los Angeles. Of course we miss the late Lionel Hampton and Milt Jackson, two exceptionally great vibraphonists. There aren’t that many African American vibraphonists. Although a few young guys are coming up now” said Ayers who formerly worked with the Gerald Wilson Band in Los Angeles. Roy has been keeping himself busy performing around the country. His new CD “For Sentimental Reasons” is due for release in April and he recently returned from overseas. “In 1966, after joining Herbie Mann’s band, I started to get international fame. I travel all the time now. I enjoy it. The later part of last year I visited Poland, London, Prague, Czechoslovakia, and Spain. I had no idea how popular my music is in these countries. The people were so friendly and enthusiastic, I plan to go back. For now, I am back in the United States where I will perform in Buffalo, NY, and of course in Jamaica, Queens, on Jan. 16. Also, I’ll be at the Jamaican Jazz Festival in the West Indies” said the eclectic performer of jazz, R&B, funk, and even hip hop. “You know, Lionel Hampton was the reason I took up the vibes. He was my inspiration as far back at 5 years old. My parents always played his records. My mother kept telling me that one day I would be great and my name would be in lights. My parents planted that idea in my head. They took me to see Lionel Hampton perform at the Paramount Theater in Los Angeles. Lionel gave me a set of vibe mallets in 1948 when I was about 7 or 8 years old. My folks told me he laid some spiritual vibes on me because I started playing the vibes some 12 years later. I haven’t stopped yet,” said Ayers who claims his parent’s vision of his success became his vision. “One of the best engagements in my life was playing with Lionel Hampton at the Village Gate in 1978. It was the ultimate experience of my life. I started my own band Roy Ayer’s Ubiquity. I call my band that because Ubiquity means a state of being everywhere at the same time. I figure if everyone buys my music, I will be everywhere at the same time,” chuckled the singer/composer/vibraphonist. “Lionel was so instrumental in inspiring my career that having him play with Ubiquity at the Gate meant the world to me,” reminisced Ayers. “I love all types of music. In fact I am supposed to do a show in France with George Clinton who is the ultimate funkster,” added Ayers. “George worked with James Brown for several years. When you come out of the James Brown school, you got to be funky! I have worked with numerous artists throughout my career. I have done the Superstars of Jazz with Lonnie Liston Smith, Bobbie Humphrey, Wayne Henderson of the Jazz Crusaders and Ronnie Laws. Jon Lucien has passed but I’ve played with him at some of the jazz festivals as well. I have shared the stage with Miles Davis, Ron Carter and Herbie Hancock. Herbie is extraordinarily talented and very versatile. He did 3 albums with me for Atlantic Records “Stone Soul Picnic,” “Daddy Bug,” and Virgo Vibes.” So far, I’ve done a total of 86 albums,” said Ayers who has been performing for 50 years. “You know the show “Fela” is presently on Broadway. I worked with Fela Kutu and in 1979 traveled to Nigeria with 17 musicians and a film crew. I made a film on Fela and myself since our careers were parallel. In fact, I did several interviews with him. I had an opportunity to explore my African roots with Fela. He was an incredible man who suffered for his beliefs. Fela was a real artist. A singer, dancer, writer, band leader, composer, philosopher, politician and married to 27 women. They all lived together. Fela told me he made love to 4 of his wives each night. I think it wore him out. He seemed tired a lot of the time, except for when he was on stage,” recalled Ayers. 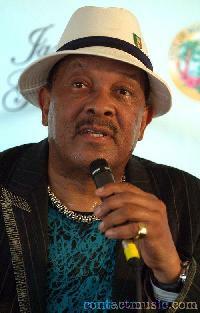 For tickets to the 8:00 p.m., January 16th, 40th Anniversary Concert featuring Roy Ayers, call 718-723-1800 or visit on line at www.Blackspectrum.com.